No known golf clubs in Fujairah. There are some large projects under development which may include a golf course. Al Wuraia Valley / Al Weirahiah Valley - looks like a golf course planned for this project - visible on models and artists renders. Fujairah Golf Resort - planned? Fujairah Paradise - no mention of a golf course but residents will be provided with golf carts to trolley themselves around the place instead of using their cars. Mina Al Fajer Resort - doesn't look like a golf course is part of it. Ras Al Khaimah Golf Course - the original RAK golf club in the foothills of the Hajar Mountains. Facilities included trees for shade, portable tee mats, and cold beer (if you brought your own). A "hole" was not an entirely accurate description of what you were aiming for - "target area" would be more appropriate. Hazards included rocks, camels, goats, and bird-spotters. A true expat experience in the 1990s, but superseded by the Tower Links Golf Club which is what most people now mean if they refer to the RAK golf course. You'll need to find an old time resident expat to show you original course. Tower Links Golf Club RAK, tel +971-7-2278553, email gconstable@towerlinks.com. Green greens and fairways in Khouzam, and a pleasant place for dinner and/or a drink even if you don't play golf. Occasional unexpected hazards though - a man was shot in the shoulder in June 2008 while playing a round of golf, according to a report in the Gulf News. Unknown whether the gunshot helped or hindered his golf shot. Waldorf Astoria Hotel RAK golf course - 18 hole golf course planned as part of the Waldorf Astoria development? Opening date end of 2011 (press release 01 March 2011)? Or maybe they were referring to the Al Hamra Golf Course. SGSC contact tel +971-6-5487777, fax +971-6-5487666, email info@golfandshootingshj.com, postal address PO Box 12, Sharjah, UAE. SGSC founded November 2005 according to website and opened February 2008 according to press release. Golf course is fully grassed (except for lakes and bunkers), 9 holes, 3600 yards, par 36, designed by Peter Harradine Golf (established by Don Harradine). Facilities include golf and shooting obviously (unknown if bad golfers are used for target practice), also basketball, gym, hair salon, paintball (savannah and jungle options), tennis courts, swimming pool, Sensi restaurant. Floodlit courts for basketball and tennis. Golf Academy with putting greens and floodlit driving range. Tel +971-6-5487047. General Manager of SGSC is Joseph Estephan, Golf Academy Director is Martin Duff. Golf clubs, trolley, cart, golf shoes available for rent. Green fees range from AED 95-165 for 9 holes, or AED 155-275 for 18 holes (February 2009 information, variation depends on size of player, membership status, and which day). Golf club annual membership fees AED 3,500 (females), AED 5,000 (males), AED 6,000 (couples), AED 1,000 (children 7-17 years). Add AED 1,000 joining fee (February 2009 information). Cheaper temporary memberships for 3 and 6 months available. For something a bit different when you get bored playing golf, there's a branch of Sharjah Islamic Financial Services at the SGSC (opened September 2007) where you can buy stocks and shares on the Dubai Financial Market. 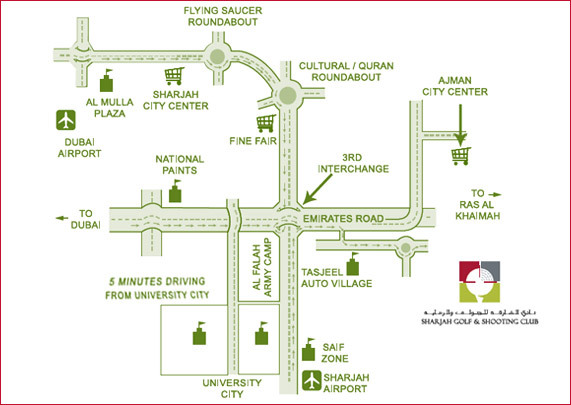 SGSC location is on the desert side of Emirates Road. Turn right after the Tasjeel Auto Village heading in Ras Al Khaimah direction, then left and drive on until you see The Paintball Park (see map). 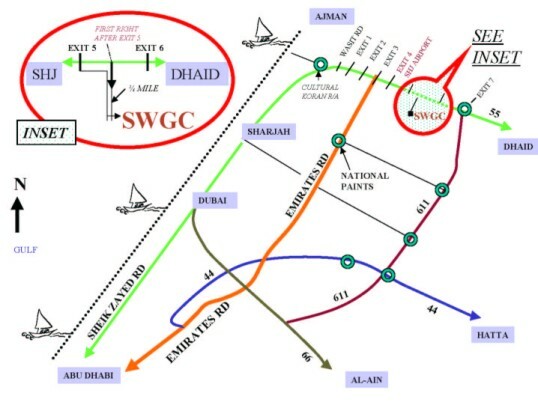 Location is off the Sharjah-Dhaid Road (Sharjah Airport Road) between exit 5 and 6 after the Sharjah Airport exit in direction Dhaid (see map). No known golf courses in Umm Al Quwain but some of the projects under development may have a golf course included. White Bay - nothing obvious in plans although residents will get golf karts to ferry themselves around instead of using their cars. www.egfgolf.com - Emirates Golf Federation website. www.ugagolf.com - UAE Golf Association website. Not available Aug 2014.
www.dubaifaqs.com/golf-uae.php (PDF and print version).